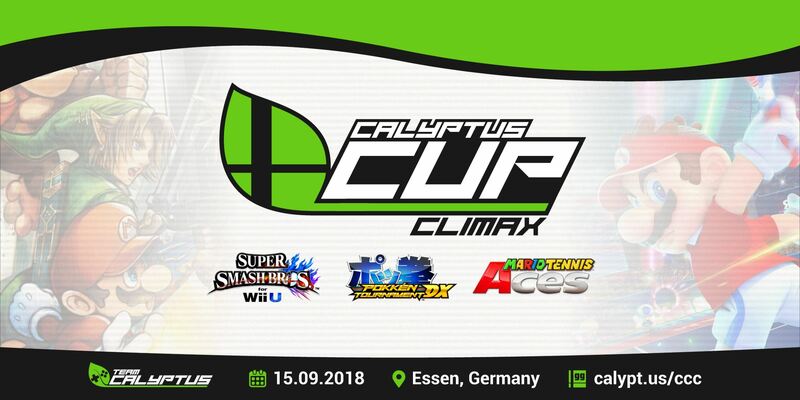 The last Calyptus Cup of the Smash 4 era will take place on September 15th. It will be the last tournament of our Final Chapter Circuit. It is your last opportunity to gain precious points for our final ranking, through which you can win the grand prize, a Nintendo Switch! Additionally, everyone who manages to get into the Top 8, wins awesome prizes sponsored by Nintendo and Lioncast! Together with our Super Smash Bros. and Pokemon Tekken DX tournaments, we are with Nintendo to organize a Mario Tennis Aces Event! The entry-fee includes every non-alcoholic drink! Soft drinks, energy drinks, juices, coffee, tea, water and more are completely free of charge. Its basically a “All-You-Can-Drink”. We urge to please place your used cups in the designated spots, which we will inform you about in the venue. Pictures of said venue and finished events are available on our website! The fees have to be paid in the venue. One part of it will be paid at the entrance of the venue (venue fee) and the other part has to be paid at our designated TO-Desks (tournament fees). Spectators only have to pay the venue fee. Although registration will be closed on Monday, the 10th of September at 11:59 pm, its possible to do a so-called “Late-Confirm” for reasonable cases, but you will be unseeded and we have to take a 5 Euro emergency fee. You have to be checked in at 11:45 am. You can do that by either paying your fee in the venue or using our designated #calyptus_cup event channel, if you aren’t able to make it to the venue before 11:45 am. Anyone who has NOT checked in through either method until 11:45 am, will be instantly disqualified. If you are not able to attend the event, after you already have signed up, please timely send us a private message over Discord/Twitter. If you accumulate too many “No-Shows” by signing up and then not attending the event without informing us, you will no longer be seeded and in serious cases, banned from future tournaments. 2 Stocks, 6 Minutes. BF =/= DL. 1 Bann, mDSR.